If you want to increase the popularity and outreach of your radio station, then you need to create a website for it. Making a website is a very difficult task and requires many hours of coding and designing. 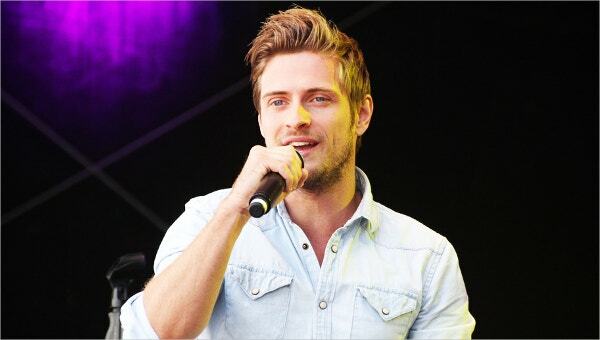 To save you from this trouble we have listed the best Radio Station Website Templates which you can purchase on the net. Using the radio station WordPress themes you can easily create a website for your station with ease. 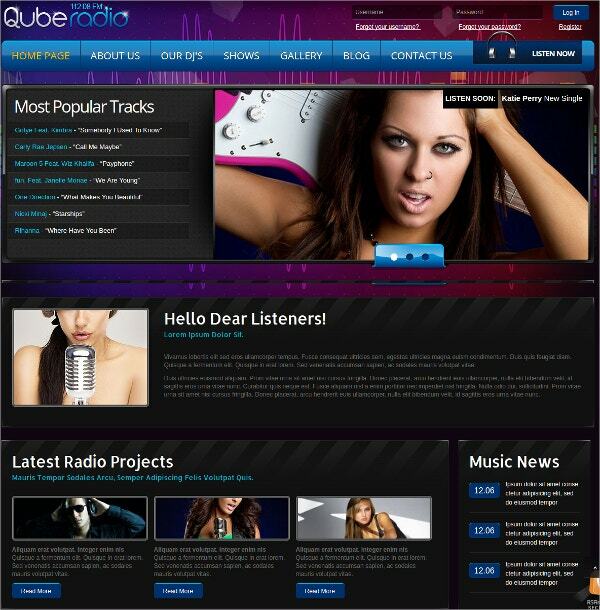 This is a very stylish radio station website template with a very modern look. It is very well designed and your website will be viewable on mobile and tablet devices as well. The newsletter subscription option will let your subscribers get alerts regarding new events and updates about your station. 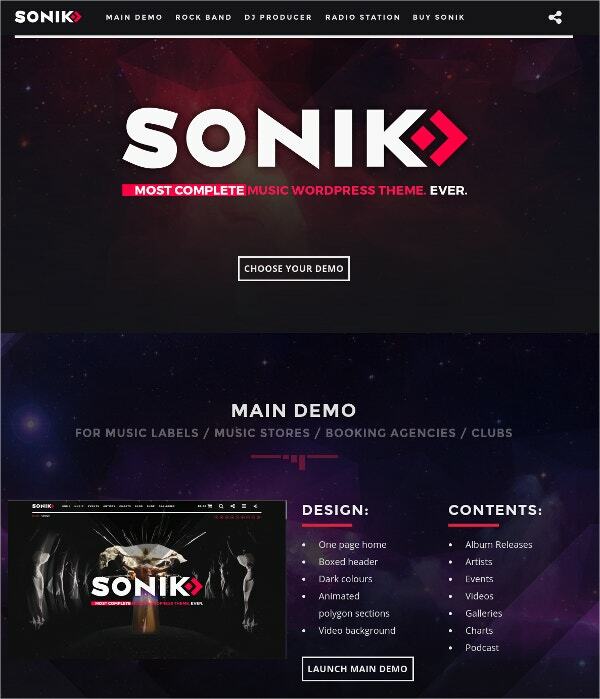 Sonic is a very attractive radio station website template that is useful not just for radio stations but also for DJs, singers, and labels to create a website for them. It can be used for online streaming of songs as well. WooCommerce support can be helpful for the online selling of songs and albums. If you wish to build a website for your local radio station, then this radio station website template can come really handy. This template is MailChimp ready and comes really useful for online marketing. You are also provided with major email client support in this template. It is supported by all major internet browsers. This radio station website template is very useful for creating a professional website for radio stations, bands, musicians, singers, etc. YouTube background can help visitors watch YouTube videos of featured songs. One page full-screen layout is provided for each page of your website. A video tutorial is available to help you in designing your website. 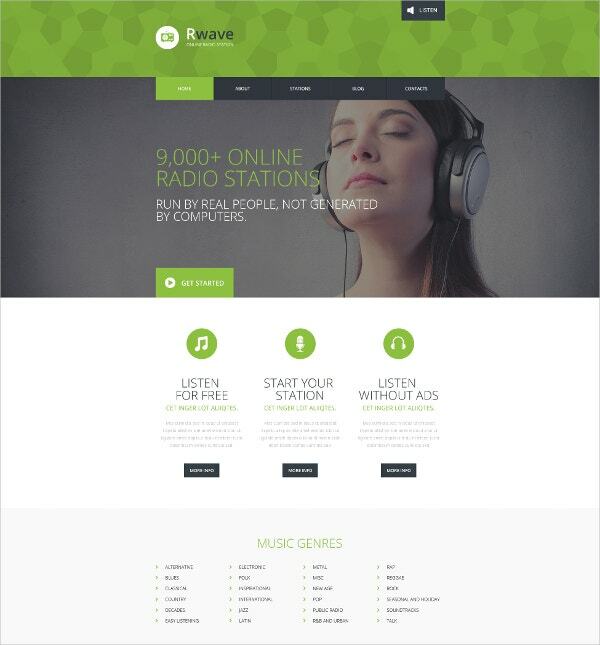 If you want to create a radio station for online streaming, then this radio station website template will solve all your needs for the creation of your website. It’s completely responsive design can help people access the site from mobile and tablet devices as well. The back-to-top button and drop-down menu options can help in easy browsing of the website. 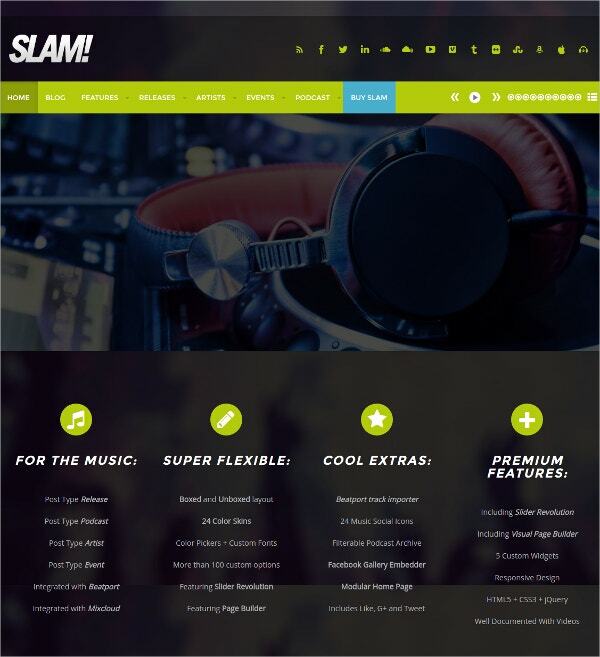 Slam is a very attractive radio station website template which will be highly beneficial for radio stations, record labels, musicians and DJs. You can use the site for online streaming of songs, podcasts, and playlists. You can even import all your releases from Beatport. You can choose from endless colour options for your website. 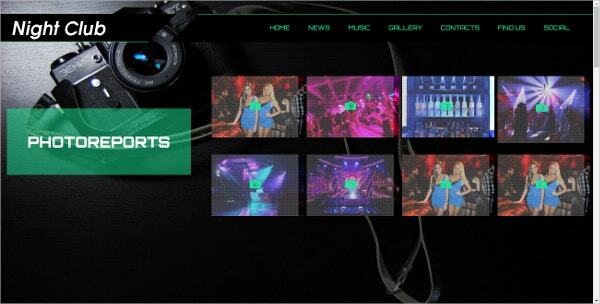 This radio station website template looks very lively and can be used by nightclubs and artists as well as music festivals and concerts. 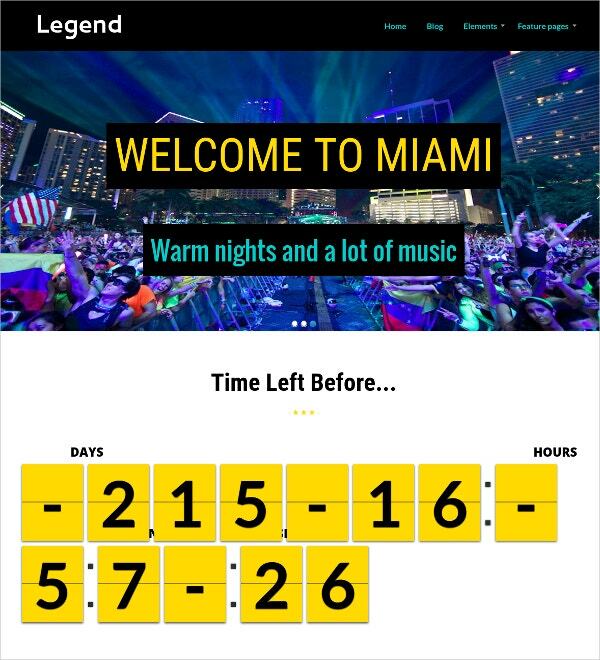 You can set a countdown timer for events, concerts, etc. Its responsive design allows it to smoothly function on various kinds of devices. Shortcodes and theme options can help you in faster designing of your website. It is a very well designed radio station website template using which you can allow your radio stations to be streamed online or even create online radio stations of your own. You can list various programs that are set to be broadcasted on your station. It is compatible with most internet browsers. 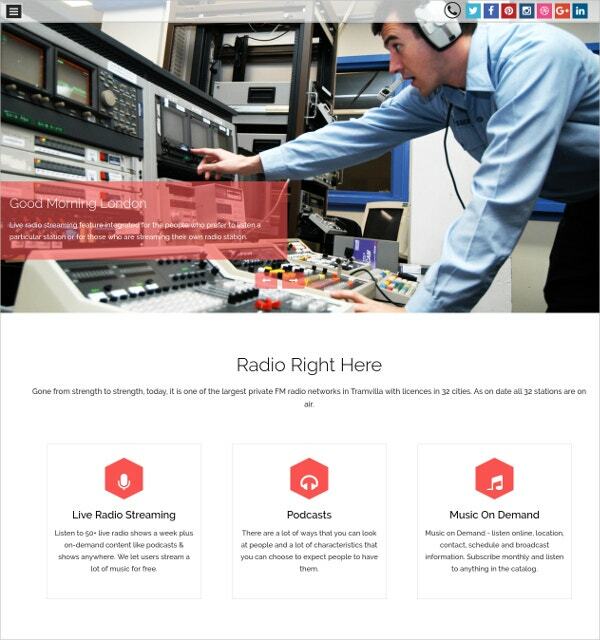 You may also see Radio Station WordPress Templates. 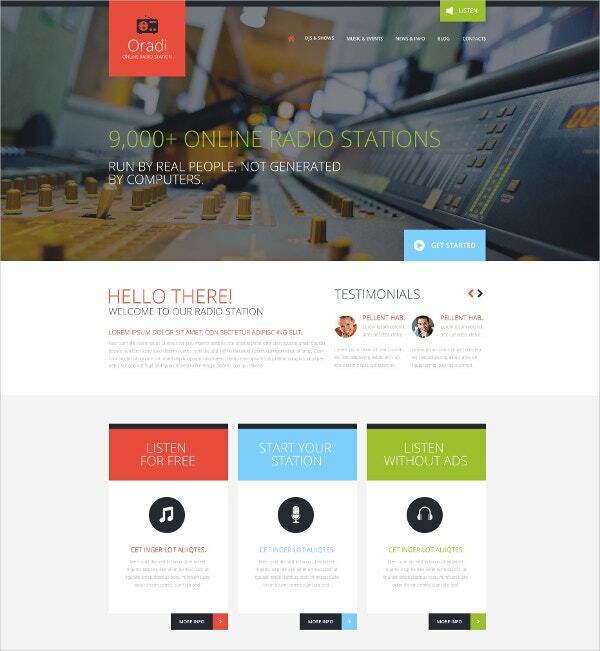 If you want to create a website for your radio station and provide online streaming, then this radio station website template will be highly useful for that purpose. Its responsive design makes it streamable on various platforms and devices. The parallax effect makes the browsing of the site a fun experience. 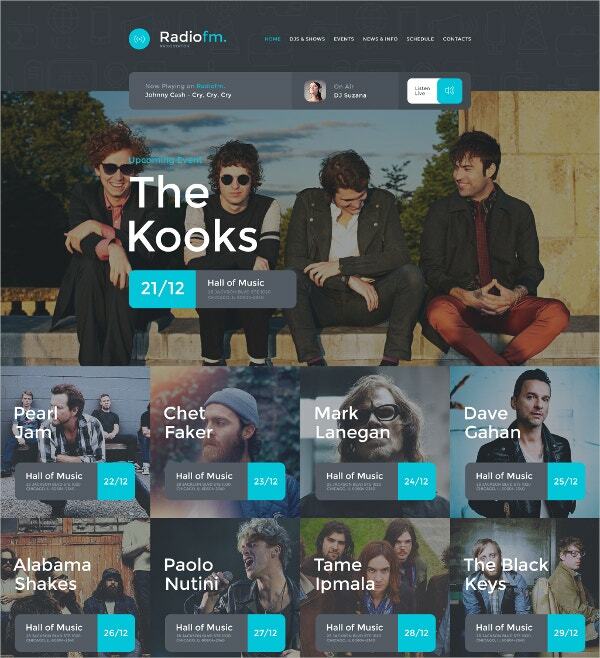 This very creatively designed radio station website template will be a great purchase for radio stations, bands, music festivals, etc to create a website of their own. WooCommerce support will be highly efficient for the online sale of songs, tickets, and merchandises. Visitors can stream online songs and videos as well. 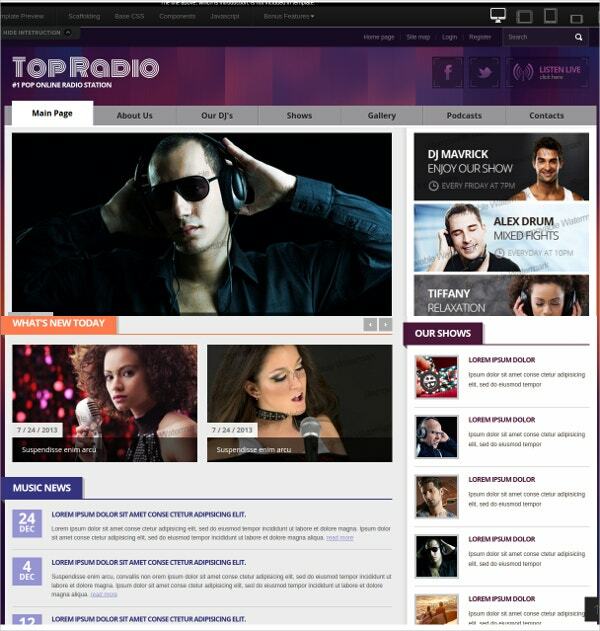 This is a beautifully created radio station website template that will make a great website for your radio station. You can add various tabs on the website regarding events, shows, gallery, latest news, etc. You can also allow live streaming and podcasts on the site. You can also create your own playlist for visitors to listen. It is a very attractive radio station website template best suited for radio stations and places to enjoy nightlife like clubs and parties. This theme is integrated with various social media platforms and thus you will be able to easily increase traffic on your website using these platforms. Built in options will help you in customizing the site. If you are looking to create a website for your local radio station, then you can immensely benefit from this radio station website template. The template offers a one-page layout for your site which fully fits the display and has a sidebar menu options present. Options are present for live streaming, podcasts and listening to specific songs for the visitors. This is a very well designed radio station website template which can be of great help to you for creating your own online radio station. This template has a very modern look to it. It is completely responsive which means it can be browsed on any kind of device like a mobile phone or a tablet. 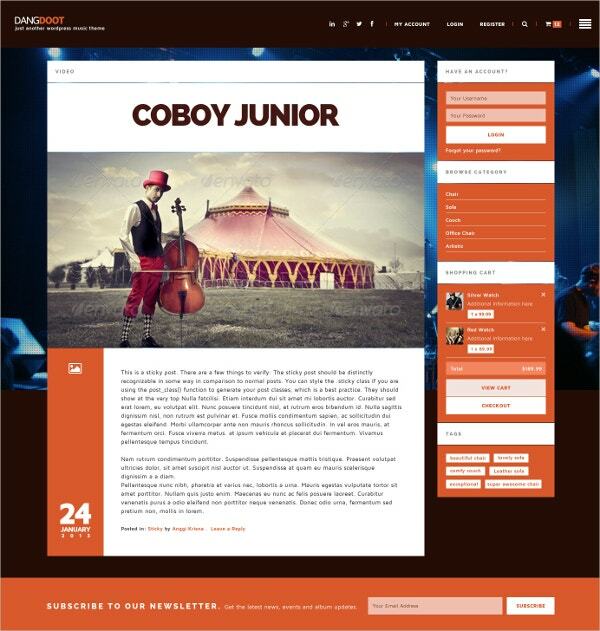 If you wish to create a very lively looking website for your radio station, club, band or entertainment magazine, then this radio station website template is what you really need. 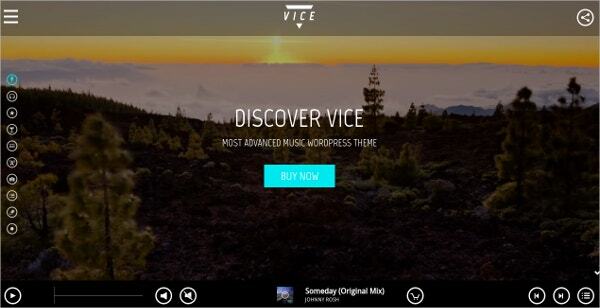 It comes with a floating music player at the bottom of the page which allows visitors to stream music while browsing other pages of the website at the same time. 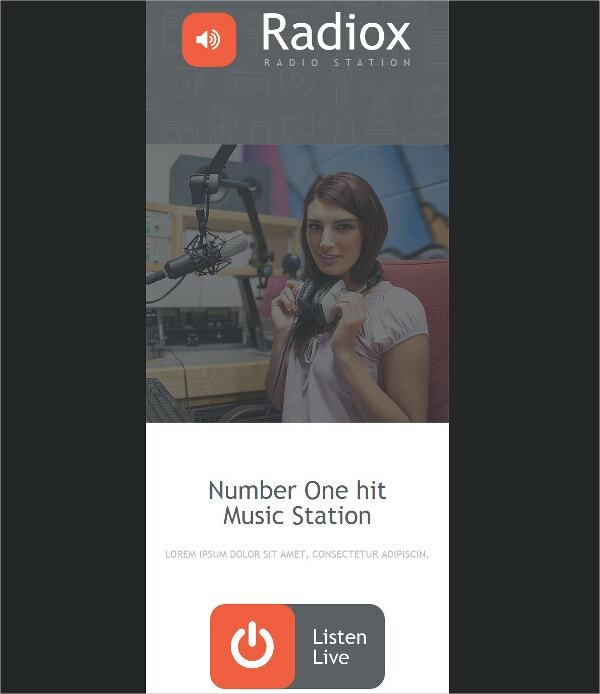 This is a very attractive radio station website template using which you can create a very nice website for your radio station. It comes with multiple useful features. 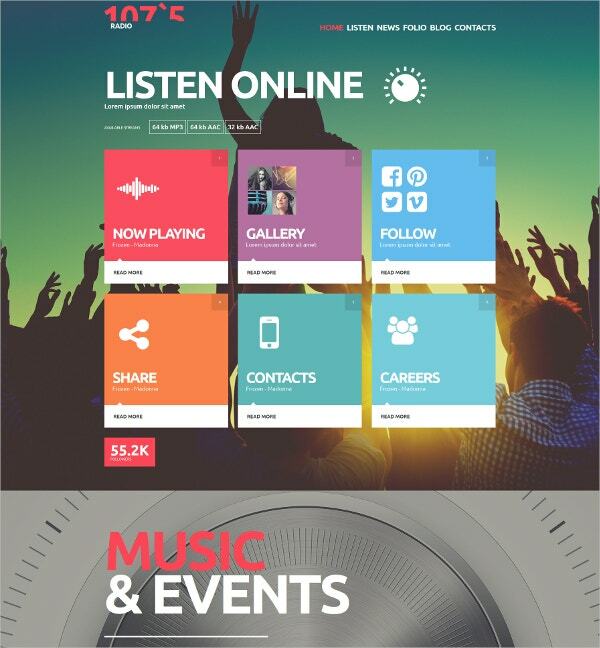 You can create events and put information regarding various programs to be broadcasted on your station. This template is supported by all major internet browsers. All the above-listed radio station website templates are extremely well designed and will surely do wonders for your radio station. 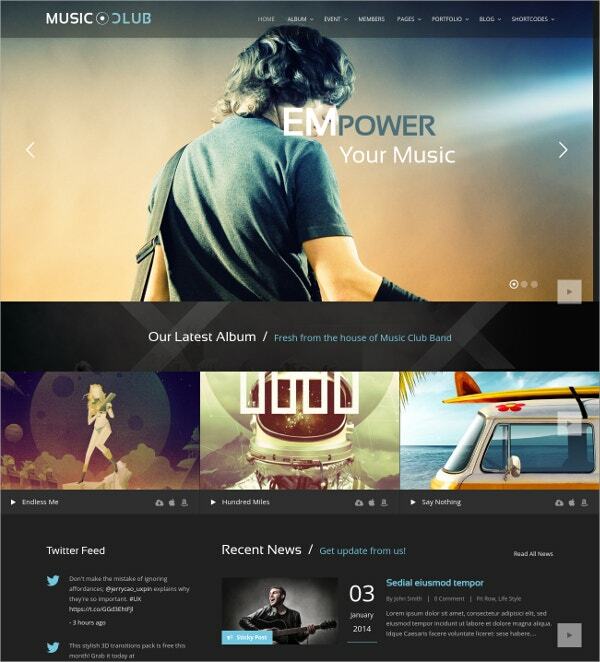 The Joomla radio station templates will be helpful in creating websites with highly useful features. Check out the different templates and create a website in simple steps for your station with the template that attracts you the most.